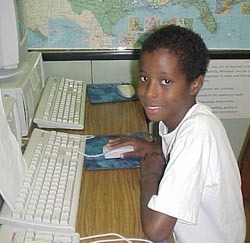 Monica, Jason and Elijah worked very hard in the computer lab to answer the 4 Kidlink questions. This is the first step when entering a Kidlink project. The questions are not hard but the last two make us think hard. How do I want the world to be better when I am all grown up? What can I do now to make this happen? 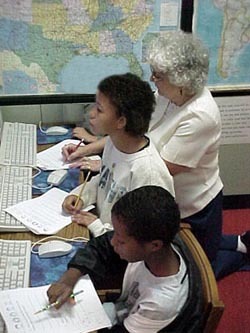 Mrs. Cropper and Mrs. Weeg helped the students in the computer lab. When they finished typing their responses they were ready to join the "Who am I?" program. They made acronyms and sent them to the Kidwai mailing list where all the other participants in the project from Slovenia, Sweden, Canada, Maryland, Texas and Italy can see. Take a look at what the students are writing in the "Who Am I?" program. My name is Monica. I am ten years old. I like to play soccer. 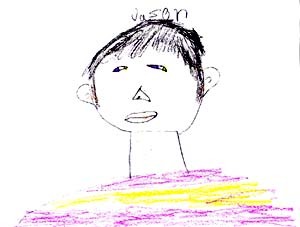 My name is Jason. I am ten years old. I like to do work at home. Here is my acronym. I like playing with my friend. Hockey is my favorite sport. From our new friends in Argentina! Hello new friends. My name is catalina. im from Bariloche argentina. I am 10 years old miy school name is "Raices y Alas". I like riding horses. How old are your? What is your name? What is your school name? What is your city? Hello new frends, my name is Nune´ I am from Bariloche Argentina.I am 10 years old. my School name is "Raices y alas "and I like riding horses. How old are you? What is your name? What is your school name ? which is your city ? Bye. Hello, my name is Lucas, i`m from Bariloche, Argentina. i`m 8 years old. my school name is ``Raices y Alas´´ I like hamburgers and meat. ¿whats your name? ¿how old are you? ¿where do you live? ¿how many students are there in your class? Hello my name is Ian. I´m from Bariloche, Argentina. I´m 9 years old . My school name is "Raices y Alas". I like eating and playing what's your name? How old are you ? where do you live?